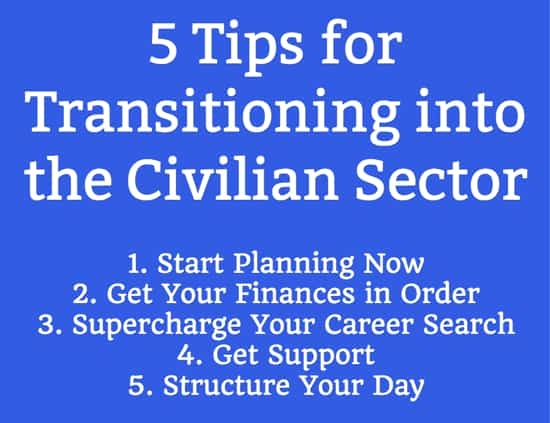 In this podcast, I discuss the military to civilian transition, and some of the areas I struggled with during my transition. I dive right into my story, where I discuss some of the struggles I went through during the transition into the civilian sector, and how I would handle things differently if I were to make the transition again. Hopefully you can learn from some of my mistakes and avoid them! Why I separated from the Air Force. I left active duty after 6.5 years on active duty. I was burned out from 5 deployments plus a one year special duty assignment in which I traveled around the world for an entire year. I was away from my home station for well over half the time I was in the Air Force. It was an amazing experience because I was young and single at the time, but I was ready for a change. How I prepared for my separation. I had already achieved my bachelor’s degree while I was on active duty. This was discussed in podcast 8 – Tuition Assistance Benefits. This gave me the confidence to step out on my own into the civilian sector, even though I was planning on moving into a different career field. I had also saved a lot of money during my travels and deployments. I had several months worth of living expenses saved, and no large bills to hold me down. Why I struggled with the transition. The transition was difficult for me. It took me 6 months to find a job which was difficult, but not for the reasons I had expected. I was financially prepared to go without income for several months (plus I was receiving unemployment benefits). The most difficult aspect of being unemployed was was losing my identity that I had associated with my role in the Air Force, and not being a part of something bigger than myself. This is a common thread among many veterans I have spoken with about the transition. And the longer you are in the military, the more difficult it can be to make the transition. The military is a unique way of life and it is a large part of people’s lives – too large to immediately replace with another job. Many veterans underestimate the emotional aspects of leaving the military. Please don’t make the mistake I made! My first post-military job. My first job after leaving the Air Force was actually as a civilian contractor on an Air Force installation. This was a huge blessing for me, because it put me right back into the military environment. My Air Force experience was instrumental to me landing that job, and it helped me leverage the success from that position into a raise and a new title when I moved to a new company almost two years later. Even though I wore a suit and tie to work instead of a camouflage uniform, I was still part of a mission I understood and identified with. This was a key part of me starting to turn things around both personally and professionally. 1. Start Planning Immediately. Everyone leaves the military. It could be after 4 years, or 10 years, or 20 years, or even 30. It doesn’t matter how long you served, there will be a transition period for you – even if you walk right into a new job, or even if you think you won’t miss it (you will). The best way to handle this period is to start planning now, before you even know when you will get out of the military. Even though my transition wasn’t perfect, this was one thing I did well. I spoke with Mark Deal about this topic in Podcast 7, when we discussed planning your military exit. We both had similar ideas regarding planning – the idea is to give yourself a variety of options so you have options when you need to make a major decision. Education is a big one – Mark and I both worked on our degrees while we were serving on active duty. You can do this by taking classes with tuition assistance, or even testing out of classes. Earning professional certifications or licenses is another great way to improve your military career and give you opportunities after you leave the military. There are a variety of certifications and licenses that are related to military career fields, and in many cases you can use your Tuition Assistance or GI Bill to earn those qualifications while you are still serving on active duty. 2. Get Your Financial House in Order. I can’t stress enough how important it is to get your finances in order before your transition. As I mentioned, money was not an area where I struggled during my transition. But that is because I was young and single, and I had been able to put away a lot of cash while I was deployed. Those who have a family and bills will have a more difficult time than I had. So it’s imperative to start planning now. You may be eligible for retirement benefits if you aren’t retiring (most retirees are ineligible for unemployment benefits because they are receiving a pension). But unemployment benefits don’t pay out very much. They will be helpful, but they certainly won’t cover all your expenses. The priority should be reducing your fixed expenses as much as possible. The less money you have going out each month, the easier it is to deal with a change of income. Try minimizing as much debt as possible and reducing expenses you can do without on a temporary basis, such as cable TV, eating out frequently, and minor luxuries. You need to save money. It took me 6 months to find a job. A big reason it took so long is because I was looking for a job in a new career field. I was an aircraft mechanic in the Air Force, and I was looking for an office job. I found it, but it wasn’t easy, and it took a long time. You may be one of the lucky few who walks into a job a couple weeks after you leave the military, or you could be like me, and it might take several months before you find meaningful employment. Either way, you will need money to help you bridge the gap. As I mentioned unemployment benefits are available for many, but they might not be enough. I recommend trying to save at least 3 months of living expenses if you can. Between your savings and unemployment benefits, you should have a decent runway to get you through a rough patch. If you can save more, then go for it. Put off major purchases in the months leading up to your transition. You don’t want to be saddled with a new mortgage payment or a large car payment when you are going through a major career change. Waiting until after your transition will help your bottom line and reduce your stress levels. 3. Start Your Career Search the Right Way. When I left the military, my initial job search was limited to online job searches. I used a variety of job search engines (Monster, Career Builder, etc.). I also looked at the various company websites in my area. Eventually I started going out to job fairs and meeting people. I was new to the area, so it took me some time to expand my professional network. If I were to do things again, I would put a bigger focus on putting myself out there and meeting people. I would accomplish this by joining professional organizations, volunteering, going to job fairs, and anything else I could do to meet people. A personal recommendation is the easiest way to find a job. It’s much easier than submitting a resume into the ether, hoping that someone will take a look at it. Speaking of resumes, be sure to take the time to craft a specific resume for each job to which you apply. You also want to have a non-military person read the resume to make sure you removed as much military jargon as possible (not everyone speaks military!). Resume writing can take up an entire article (or even an entire book), so I will link to these resources to get you started: Epic Resume Writing Guide, Writing a Post-Military Resume. 4. Get Support. Everyone needs support. It will be easier if you are staying in the same area, or you are moving to be close to your family or old friends. It’s much more difficult if you are relocating and don’t know many people. When I separated from the Air Force, I moved from Texas to Ohio. I knew two people there. I was essentially starting from scratch. Try to get involved wherever you can. This can include being active in your church, joining a volunteer organization, taking a part-time job, joining a sports league, or anything else that will get you out there and interacting with people. Don’t be afraid or ashamed if things aren’t easy and you need to seek professional help. It’s better to reach out than to shelter down. 5. Maintain Structure in Your Day. One thing I did well was put my job search first. I spent a couple hours a day looking at the job sites, rewriting my resume, submitting it to different places, etc. What I didn’t do well was structure the rest of my day. I spent a lot of time reading and playing online poker. I had 6 months that I could have used better. I could have started a website (I actually started my websites about a year after I left the military, and the transition was part of the reason I did it). I could have started writing a book. I could have taken a class at the local university. I could have done a dozen other things, but I didn’t. I wasted a lot of time with excuses and laziness. Please don’t make the same mistakes I did when you make your transition. Put some structure into your day. It will help you with your job search, and it will help you better pass the time. Bonus: Consider Joining the Guard or Reserves. This isn’t for everyone. You may be ineligible to join for various reasons (retiring from the military, medical reasons, etc.). Or you may be completely burned out of the military like I was. I was done and wanted nothing to do with the Guard or the Reserves. The Ops Tempo was still high when I got out and I knew that if I joined the Guard or Reserves, I would be highly likely to deploy again. But I wish I would have known more about the opportunities available in the Guard or Reserves. It may have changed my mind. Continued membership in the greatest military in the world (not being part of a mission was a huge reason why I struggled with the transition). Continued pay and benefits. The pay is only for a couple days a month, but even a few hundred dollars (on up) can make a huge difference when you are out of work. The benefits are also nice. TRICARE Reserve Select is around $200 a month for a family plan and the co-pays and deductibles are very low. This is incredibly inexpensive compared to virtually all civilian insurance plans. Continue earning Points toward a military retirement. Very few companies now offer a pension plan, and the military has one of the best. A Reserve Retirement is still a very valuable thing to have, with the pension, health care benefits, and other benefits. Grow your professional network. Guard and Reserve units are like having another family. You will quickly meet new people and through them, your professional network will grow. I know several people who have found jobs through contacts in their Guard units. I can guarantee you will find a job through your unit, but it’s better than sitting at home (like I did!). My transition wasn’t easy, but it ended well. I hope these tips will help make your transition go a little more smoothly than mine! Very good read thank you for putting time and effort into this.